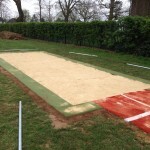 We can install athletics facilities with a number of different high jump surfacing options to choose from. The specifications we offer range in performance standard from simple school run up areas to full sized IAAF competitive surfaces. Prices for each of the available designs will also vary from project to project depending on the chosen specification, area size and location. Our team will be happy to offer you some expert advice on these different high jump flooring types if you fill in our contact form to the left of this page and let us know what you are looking to install. EPDM Polymeric – For athletics clubs and international events, this rubber surface type will be used to provide a solid run up surface for the high jump fan. These will often be installed in larger area sizes as they are used by professional athletes in competitions. 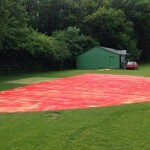 Clients can choose from different coloured designs for the polymeric athletics surface, so school or team colours can be chosen for a unique look. 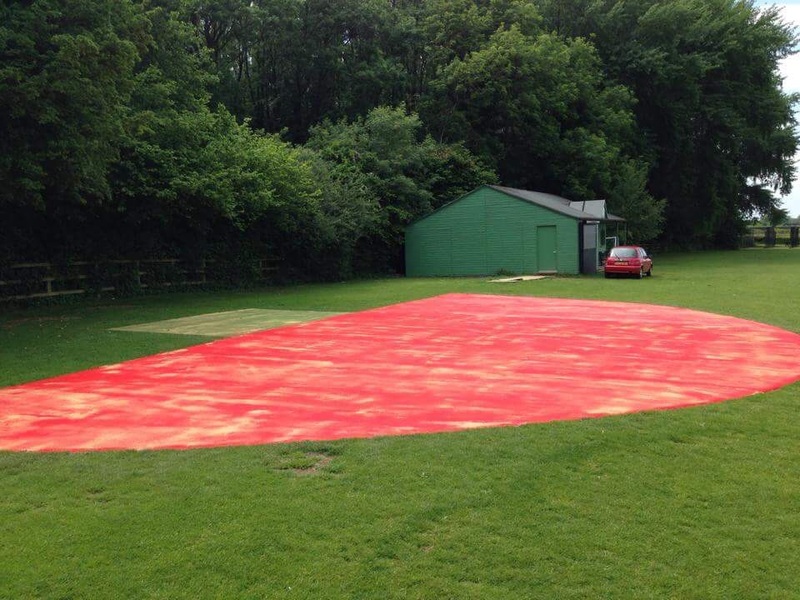 Multisport Synthetic – This high jump surfacing specification is made up of a needlepunch synthetic carpet with a sand infill to keep the fibres stable. The artificial turf is created using a needling process which puts lots of holes in the surface to allow excellent water drainage in all weather conditions. Schools which are only going to use the athletics area as a recreational facility and do not need IAAF standards will typically go for this option. In terms of prices for the different track and field surface types we offer, the most cost effective specification for a school would be the Multisport synthetic turf system. 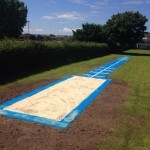 It provides a durable all weather area which can be used for PE lessons and after school clubs to let kids practise their skills and compete in local competitions. However if you would like to discuss the costs for both the needlepunch turf and the polymeric rubber designs we can supply product sheets and quotes for each one. Simply enter your details into the quick enquiry form on this page to request more information on the best choice for your facility. 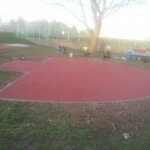 Our professional installers have a great deal of experience in working with schools, universities and clubs to install various types of athletics track and field surfaces to all ability levels. 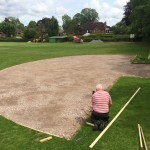 The high jump surfacing that we have available is installed to meet varying designs and budget requirements as a custom service for every client we work with. Through working on numerous projects as athletic surfaces specialists, we know each facility can be different. The typical dimensions for a high jump run up fan will allow at least 15m of run up space before the athlete completes their jump. However we can vary the area size to be bigger depending on the amount of outdoor space you have available. 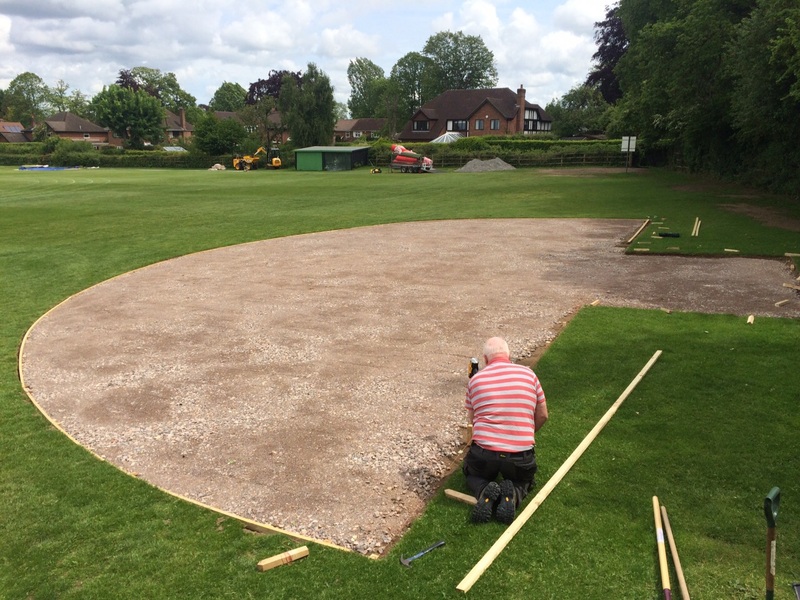 If you would like a price for installing synthetic high jump surfacing in either polymeric rubber or needlepunch turf, please contact our team. All you need to do is complete the enquiry form on this page and send us your details so we can put a quote together for you. A brand new generation of cost-effective in addition to lasting outdoor athletics features that give a way into sports club venues is being created. Many schools and colleges are finding it difficult to update their sports areas for many athletics activities, which means children cannot take part in these sports activities. The reason for this might sometimes be because of limited space outdoors or a shortage of funds available for the school. Compact sports facilities are made to fit existing areas and spending budgets, in addition to provide functional, motivating facilities in which boys and girls of any age and also every ability can enhance their physical fitness and confidence. By making use of these, kids are qualified to improve running, jumping and even throwing skills that are part of the FUNdamental phases of enhancement. Kids will be introduced to a variety of activities, assisting to increase the quantity of children doing compact athletics. Several of the widely chosen facilities include shuttle running tracks, throwing areas and even jogging tracks. To create a multiuse athletics area, a simple 60m long jump track could also be used for sprinting, baton racing as well as hurdles to make the most out of the area. For schools with only a little space or money, this can be the perfect alternative to a full-sized running track. One good reason why getting a multi athletics area fitted is beneficial for the children is simply because it allows them to try various events and find one which they enjoy, that could guide them to further opportunities later on. A serious deficiency in existing athletics provision is a shortage of developmental facilities that are made for a beginner and young people at the first stages of the athlete growth model. It is crucial for youngsters to participate in athletics from a early age – KS1 and KS2 – and proceed throughout KS 3 and 4. A new set of guidelines has been produced by UKA to make certain that athletics features become more available to young people. The plan provides educational institutions with more compact, recreational quality features that may be made with a vibrantly coloured, appealing look for younger people. We have carried out numerous projects like this across the UK for schools and local clubs so feel free to contact us if you are interested in the installation process for one of these surfaces. Considering that the specification and design of compact athletics facilities are able to be modified, near enough any club or school could have one constructed. 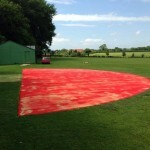 Discus circles, jogging straights as well as jumping runways are among some of the more popular components of these recreational surfacing types. For each unique project the design and also sizes could be adjusted to fit all of the essential requirements, creating a bespoke final result. Many schools have smaller sized athletic tracks installed to create a more cost effective option compared with a full sized facility. Compact sports and athletics facilities are flexible, enabling them to be used for a range of organisations. Current sports activity and play provisions in primary schools, secondary schools, universities and colleges could be made better by putting in the compact sports and athletics facility. Children of each school key stages can benefit from personal development while studying new skills throughout the different sporting events. One good reason you will need to update your sports and athletics facility is to motivate young children to take part in these kinds of sports activities. Compact facilities are a reasonably-priced alternative available to virtually any school or sports club. If you would like the young people at your establishment to build on physical activity abilities, our recommendation is that you get a smaller sized facility installed as FUNdamentals are presented. UKA is looking to increase interest in athletics and presenting accessible facilities for youngsters is a huge step towards this aim. This is generated even more by holding IAAF and IPC World Championships within London in 2017. 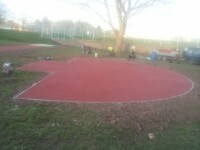 When using such compact athletics facilities, young children could find a specific activity that they like and could enroll in a qualified sports club – helping to develop involvement in athletics. To discuss the costs and designs of a professional or recreational high jumping facility, please send us your details via the form on this page. We have a wealth of case studies and product sheets that our athletic surfacing specialists can send over to help you choose the best high jump surfacing for your project. We’d be glad to send you over some example of our previous work, and talk through the prices for installing these surfaces. 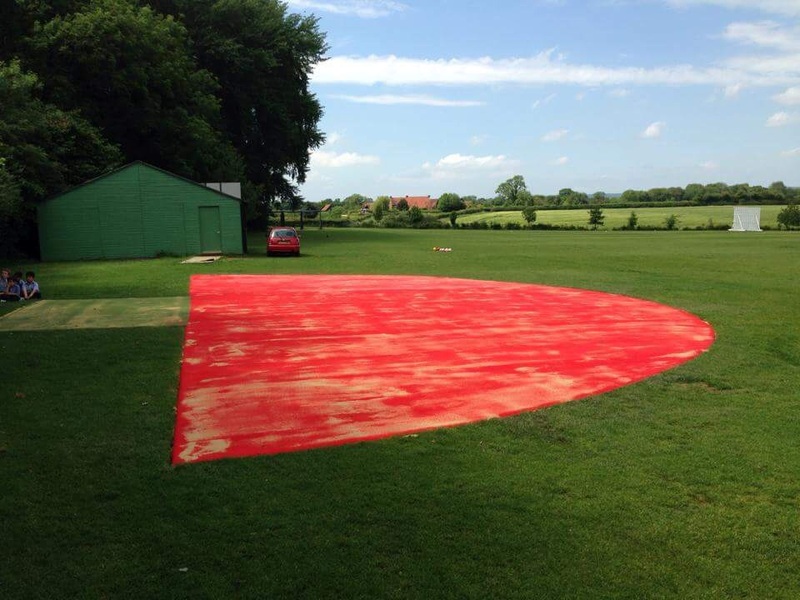 There are many designs and products available when it comes to high jump surfacing, and we can install these to suit exactly what you need. Just let us know if you have any requirements or budgets in mind and we’ll do our best to stick to these.